being MVP: Gift Gathering Hop Giveaway! Tanga.com has been online for 5 years and delivers 6 new daily deals to your email each night at 7:00pm PDT. They offer a variety of unique products and fun t-shirts, along with magazines, electronics, jewelry and more. Not to mention, Tanga offers games and online puzzles that give you the possibility to win great prizes. Most of the products on the site are only available for 24 hours, but unlike other sites, Tanga.com offers Second Chance Deals. These Second Chance deals offer the costumer another shot at a missed opportunity with the daily deals. Not all products will continue to the Second Chance deals though so make sure to purchase the items you want as a daily deal! Make sure you visit each blog participating in the giveaway hop. You will be able to gain entries for each giveaway entered and a bonus 15 entiries for entering on all of the participating blogs. 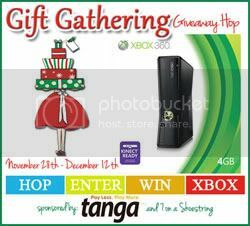 When you are ready to enter the Tanga Xbox 360 Giveaway, visit 7 on a Shoestring and fill out the Grand Prize Rafflecopter form. Check out my Review on the Amazing Shimmer & Bliss Scarf HERE. These are so light yet warm and stylish. They are even great when layered. Check out Shimmer&Bliss on Facebook and Twitter. Black with Raspberry Tip Shimmer&Bliss Scarf! I really like the amethyst Shimmer & Bliss scarf. I follow you via gfc as Angela Huffines. I also love the Longhorn Orange scarf! I like the Amethyst scarf! i would like the valentines pink scarf! My wife likes all kinds of scarfs. She would wear any!! I like the Black w/ Raspberry Tip like pictured! So cute! Hello, I follow via GFC = trishden and I love the Sage scarf. Thanks for a great giveaway! The Coral Seaside Scarf is so beautiful!! I LOVE it!! I like the Sage scarf and I follow on gfc. I love the Amethyst scarf as well. Since yellow is my all time favorite color I would love the canary. I like the amethyst shimmer and bliss. I like the black with crimson tips the best but if I had to choose a 2nd one I'd choose Amthyst! I love the black ans raspberry but another great one was the amethyst! Beautiful! I love the Coral Seaside Scarf! I would choose the Crimson scarf. Thanks! gfc follower michele p and like the turquoise one. Love the valentine pink one! I like the Sage scarf. I like the crimson scarf. hydepennym@gmail.com I would love, absolutely love the longhorn orange long scarf. I like the Amethyst scarf. I would love the pink one - super cute! I love the amethyst scarf! I really like the Black with Raspberry tip. The Crimson scarf is gorgeous! I actually like the black with raspberry tip more than the others, pink and black are my favorite color combos! I love the Longhorn Orange scarf! I also like the Crimson. The Valentine's Pink is cute too. Luv the coral & seaside. I'm tempted to say black, but I'm going with TURQUOISE! I like the turquoise scarf. Follow (Becky S.) - Like the emerald. ramirezpablo1981 at yahoo dot com!! I follow on GFC as TommyGirl. I really like the Coral Seaside scarf.